Happy First Week of April! Do you have a job lined up for summer? Take a peek at the latest national jobs roundup! On Friday, March 29th, I attended Tufts University’s one-day symposium, “From Monument to Memorial: Space, Commemoration, and Representation in America Now.” Organized by the Department of Art and Art History, the symposium invited audiences to consider the role of public civic art in America and its current impact in our present political climate. Discussions on history, heritage, memory, and legacy were the undercurrents of each presentation. Before the first panel began, Tufts University Art Gallery Director Dina Deitsch discussed the symposium organizers’ deliberate choice to host the event in Tufts’ Alumnae Lounge, a rather contentious space on campus due to the nature of its monumental murals. Commissioned in 1955, the mural’s east wall depicts the historical founding of Tufts on Walnut Hill, while the west wall shows Tufts students, faculty, and deans in an attempt to provide a “snapshot of student life” in the 1950s. Although there are at least fifty individuals painted between the two walls, almost all of the figures are white, Protestant men (except for a few white women). In fact, the only reference to Medford’s diverse population is a small image of the Isaac Royall Slave House, and the artists completely ignore the fact that Walnut Hill is a site of spiritual significance for the Mystic people. The Alumnae Lounge murals do not portray the diversity of Tufts University, both past and present. (Stay tuned on updates concerning the murals; there is currently a working group determining how best to make the space more inclusionary. An announcement about the murals’ changes to come will be made in the next few months, according to Deitsch.) Considering the ongoing debates concerning the Alumnae Lounge, the space served as a fitting backdrop for the day’s discussants, with Deitsch’s speech further setting the tone for the issues at heart of each panel. The morning session, “Local Histories/Contested Spaces,” was comprised of four panelists: Danielle Abrams, Professor of the Practice in Performance at the School of the Museum of Fine Arts; Kerri Greenidge, Professor of History and Director of the Center for the Study of Race and Democracy at Tufts; Diana Martinez, Director of Architectural Studies at Tufts; and Kymberly Pinder, Provost of Massachusetts College of Art. Each panelist discussed a controversial site, monument, or public art project and the importance of re-contextualizing it in its proper narrative. For instance, Danielle Abrams talked about her research concerning the segregated Lincoln Beach, an amusement park that was open from 1939-1964 in New Orleans. Today, Lincoln Beach is in ruins, and the nearby “whites only” Pontchartrain Beach Amusement Park is often more referenced in the archives. Abrams is working to uncover these archives and prevent the complete erasure of Lincoln Beach from memory by collaborating with the last living generation of individuals who used to frequent the park and can speak to their experiences of segregation. After the morning panel session, symposium participants and audience members had the opportunity to go on a two-hour guided bus tour led by Kendra Field and Kerri Greenidge of Tufts’ African American Trail Project. The Trail Project is a collaborative effort among students, scholars, and community members, intended to interrogate Massachusetts’ white history. With an aim of placing greater Boston historical monuments in their proper context – that is a narrative that also includes the memory and experiences of “historic African American, Black Native, and diasporic communities,” the Project is bringing to light history that has long been negated. The sites on the tour span five centuries and five neighborhoods of greater Boston, including Somerville/Medford, Beacon Hill, Roxbury, and Mattapan. Some examples of tour stops include the Dorchester North Burial Ground, Bunker Hill Monument, Royall House and Slave Quarters, W.E.B. Du Bois House, the Charles Street Meeting House, and Marsh Chapel. Sites continue to be added to the growing list, and members of the public are welcome to suggest or edit any site. As the symposium drew to a close, panelists left the audience with a series of questions to consider. How do we represent highly personal histories, and who do we represent in telling said narratives? How can we reconsider commemoration in light of recent violent events such as the Unite the Right rally in 2017? When should we preserve history, if at all, and what should we do with contentious spaces or monuments? For a room filled with museum professionals, artists, professors, trailblazers, and graduate students, these are timely questions for everyone to think about in our ongoing work of reframing histories. In November of 2018, French President Emmanuel Macron made headlines (and shook the museum world) when he released a report detailing the restitution of “African cultural heritage to Africa” from French museums long known for their collections of sub-Saharan objects. He called for the swift return of twenty-six royal Dahomey works of art back to Benin, objects that were taken to France in the late nineteenth century as a result of colonial expeditions. Conversations concerning such Benin objects have often dominated restitution debates focused on African culture – but what other countries from the continent are also seeking the return of their tangible heritage? One case study that has recently lost political steam is that of the vigango memorial posts from the Mijikenda peoples of Kenya. Considered Kenya’s cultural patrimony, vigango memorial posts are tall and narrow “spirit markers” made of wood that resemble an abstracted male body, often incised with repeating geometric patterns and painted. Sometimes up to nine feet in height, vigango memorial posts represent deceased male members of the Gohu society, individuals who were known in their communities for both their wisdom and wealth. Once installed, vigango are never to be removed or disturbed, as they represent the “incarnation of the deceased” and continue to play a central role in Mijikenda communities, such as preventing misfortune. Despite their communal importance and efficacy, vigango have long been subject to theft and exportation among art dealers and collectors abroad. In 2007, for instance, it was estimated that over four hundred vigango had entered the collections of some nineteen museums across the United States, with often questionable acquisition histories. The debate involving the repatriation of vigango is complicated, involving Mijikenda youth seeking a quick profit, unsigned UNESCO deals, and art market/museum ethics. 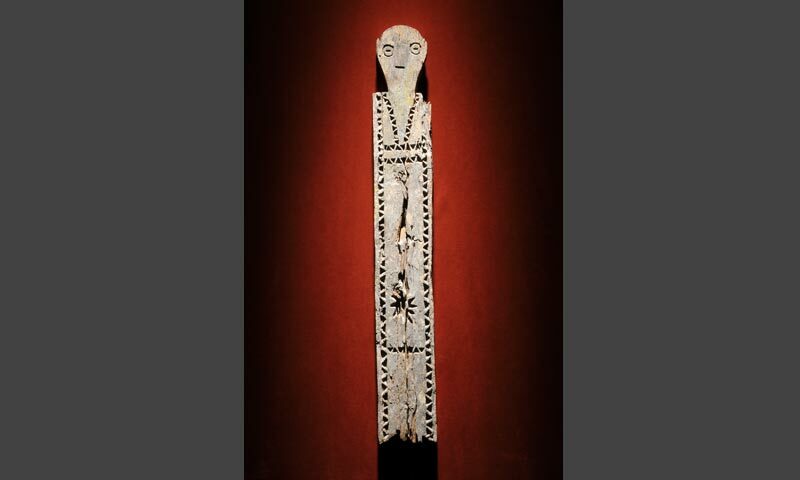 A recent exposé in African Arts estimated that a kigango (the singular form of vigango) could fetch anywhere between $150,000-$250,000 if placed on auction today (in comparison to $5000 each at a 2012 Paris auction). While the Denver Museum of Nature and Science recently tried to repatriate thirty of its vigango, the memorial posts never left the United States due to an unexpected and exorbitant tariff that would have been charged at Nairobi’s Jomo Kenyatta International Airport (the tariff is equivalent to USD $47,000). Unfortunately for this costly reason, several vigango that were repatriated from California State University, Fullerton in 2014 currently sit in a crate in the airport’s customs’ shed. Although the vigango may be back in their country of origin, no institution involved in their return intend to pay the tariff fees. Until a solution is agreed upon, the vigango will remain in political limbo. Hello job seekers! Here’s the national museum jobs round up for the week of March 10th! Should We Defend the Universal Museum? How can museums thoughtfully represent art that was never intended to be displayed in the first place? Should a museum contextualize the art it chooses to display, or does this unintentionally create an “othering” of one’s culture or heritage? Do museums have a responsibility to cast meaning onto an object, or should the art speak for itself? As a second year Master’s candidate in art history and museum studies with a focus in the politics of display concerning non-western art, these are just some of the many critical questions I regularly grapple with and consider. Currently, I am confronting these challenging notions in a seminar called, “Who Owns the Past?” Each week, my classmates and I discuss heritage in relation to nationalism, colonization, and questions of ownership while examining cultural property case studies (e.g. the ongoing Parthenon Sculptures debate). The so-called ‘universal museum’ was the topic of discussion in our last class meeting. Universal museums, sometimes referred to as ‘encyclopedic museums,’ showcase a wide breadth of collections from around the world. Examples of such institutions include the British Museum, the Louvre, the Getty, the Metropolitan Museum of Art, and the Museum of Fine Arts, Boston, places where a visitor can encounter everything from Japanese narrative handscrolls and ancient Roman coins to West African textiles or contemporary sculptures. Although one could argue that universal museums promote cross-cultural learning and engagement by providing visitors with a multitude of diverse art forms all under one roof, these institutions have also been harshly criticized for several reasons. First, for the way they defend their ownership of objects acquired in questionable ways: in 2002, for instance, nineteen of such institutions released a “Declaration on the Importance and Value of Universal Museums,” a joint statement that argued universal museums should retain other nations’ cultural patrimony (objects often subject to repatriation debates) because “museums serve not just the citizens of one nation but the people of every nation.” Universal museums have also been critiqued for their location; most are predominately in the West. Finally, rather paradoxically, universal or encyclopedic museums are in fact nationalistic. Their collections showcase objects from places ruled by the West, reinforcing imperial messages. Considering my classmates’ and I’s critiques of universal museums, our professor asked us if we should defend them. With such colonial baggage, what’s left to argue in favor of the universal museum? One of my colleagues, in playing devil’s advocate for this conversation, asked the class to consider if we are perhaps “over-villifying” the universal museum. In its pursuit to provide access and educational resources to the public, is the mission of the universal museum still inherently good? We did not come up with an answer or solution, instead fixed on the neo-colonial rings that universal museums still perpetuate. As it turns out, a prominent national museum in Europe may offer a solution. Recognizing the “darker side of a country’s history,” the Rijksmuseum – Netherlands’ national museum in Amsterdam – announced it will open an exhibition meant to bring light to the country’s history of slavery. This exhibition, set to open in the fall of 2020, will be the museum’s first show dedicated entirely to slavery. According to the Rijksmuseum website, the “exhibition testifies to the fact that slavery is an integral part of our history, not a dark page that can be simply turned and forgotten about. And that history is more recent than many people realize: going back just four or five generations you will find enslaved people and their enslavers.” I think an exhibition such as this one is a strong step towards creating a more honest narrative in the canon of art history, and I hope more institutions follow suit. What are your thoughts on the so-called universal museum? Do they continue to confirm prejudice or promote tolerance? Where do we go from here?